Who does not like potato chips that too if it is home made? My maternal grand mother prepared potato chips with a difference. 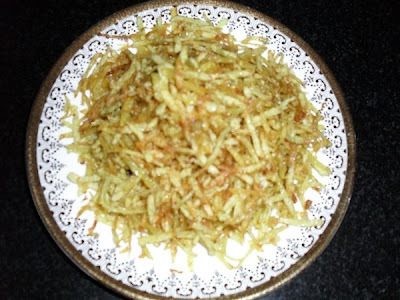 At a glance the fried chips looked like' khara sev' and no one could believe that it was all potatoes chopped so finely by my grand mother's deft hands. She cut the potatoes into thin uniform strips which resembled tooth picks! What ever grand mother prepared she did it with great passion and immense patience, turning out the best of dishes which every one in the family raved after. After grand mother my sister has mastered the art of preparing the special potato chips. She has found a quick and easy way to prepare 'grand mother's chips' which tastes equally good. Here is her recipe for the ' urulaikizhangu chips with a difference'. 1. Wash and peel potatoes. 2. 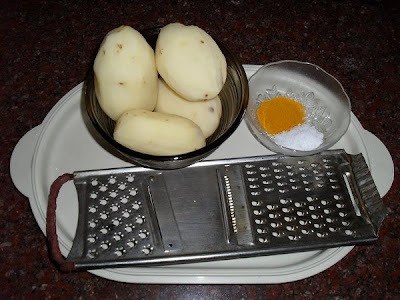 Grate the potatoes using the bigger holes in the grater and immerse the gratings in cold water for fifteen minutes. 3. Mix salt and turmeric powder in 1/4 cup of water and keep it aside. 4. 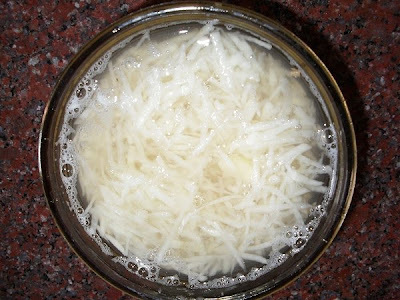 Drain the potato gratings and spread the gratings on a towel to remove excess water. 5. Heat oil in a kadai and drop a handful of potato gratings into the hot oil. 6. Add 1/4 tsp of salt and turmeric powder solution while the potatoes are still hissing and bubbling. 7. Stir frequently and fry the chips evenly till the colour starts changing into a deep yellow . 8. 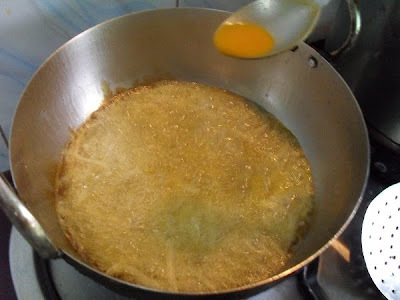 Decrease flame immediately and remove the crispy chips using a perforated ladle and drain on a paper towel. 9. Increase flame and fry the next batch. Enjoy the yummy and addictive ' urulaikizhangu chips with a difference'. lovely one.. perfect for this season !! Nice recipe.....just one question....won't the potato turn out to be very watery if I grate it? Woww, if i make them, i wont stop munching them...yummmy crispies.. 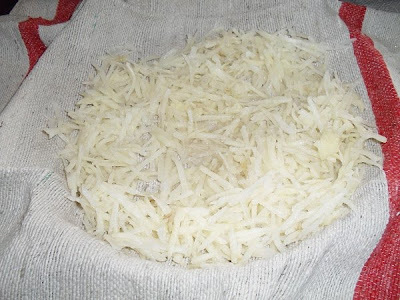 The potato gratings will become mostly dry when drained and spread out on a cloth.Little bit of moisture is no problem. The moisture will be gone when the hissing stops.The chips will start becoming crisp very fast at this stage as more surface area is exposed to hot oil.Decreasing heat and removing the chips quickly will give the desired results. Potato gratings can be fried in a metal colander immersed in oil in the kadai.This makes it easier to remove the chips at one go without burning them, provided the tongs has a firm grip.Utmost care is needed while using this method. Thank you and wish you all the best.Chitra. I remember my paaty used to make matchstick type chips with senai kizhangu..as in yam! It was so yummy and so crisp yet melt in the mouth you could never stop eating them.